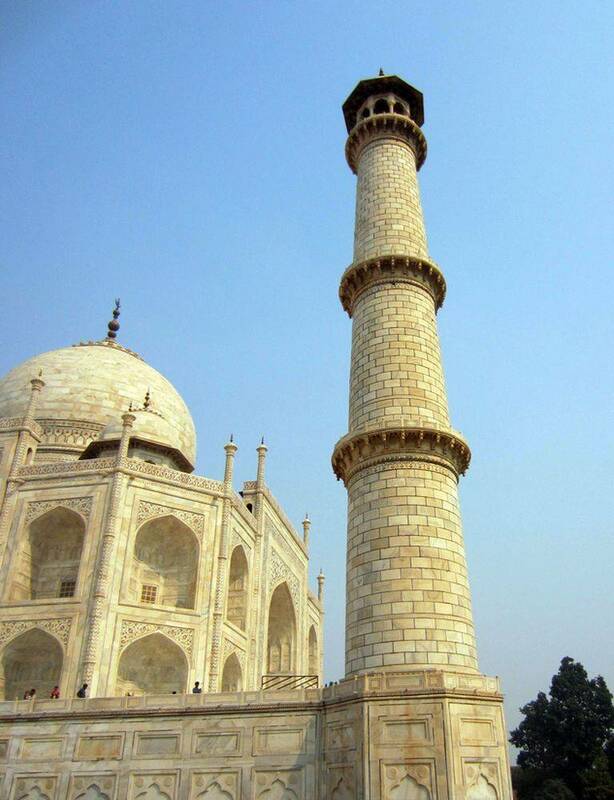 The minarets of the Taj Mahal are quite discreet, their role is to support the impression of elevation of the mausoleum while bringing a lightness to all buildings. 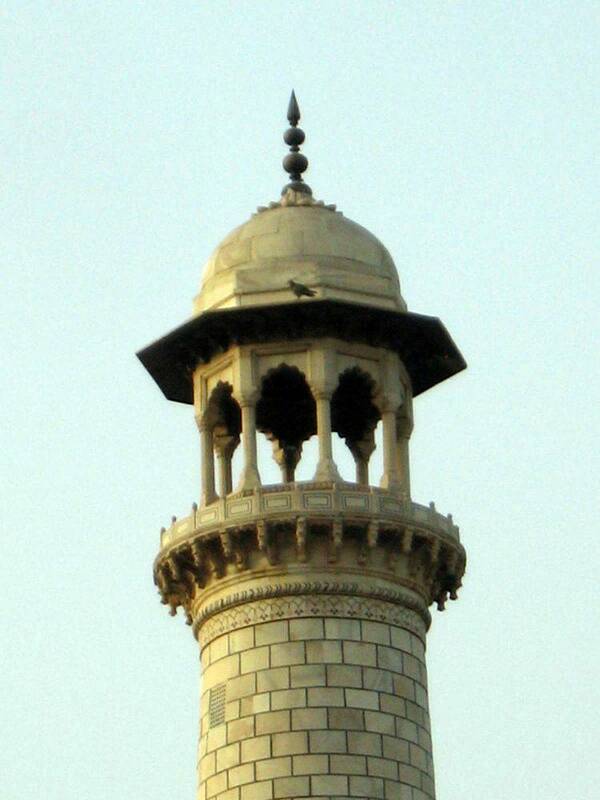 Minarets are an important architectural element in Islamic art. The word "Minaret" comes from "Manara", "lighthouse" in Arabic, itself from "nur", "light". So there is a logic, and we can see the muezzin officiating at the top of a minaret as a lighthouse spiritually guiding the population. There were initially no minarets in the Muslim religion, nor was there any parochialism in the Catholic religion. Both came later, to rise above a growing population. Moreover the minaret is a symbol of the elevation to the sky, a sort of bridge between heaven and earth. Here too, the Catholic religion has a similar symbolism. A minaret consists of the base, the trunk and a gallery. The base is usually below the surface, it is perpendicular to the ground. The gallery, it is at the top, it is largely covered. In the Islamic architecture of South Asia, the gallery is often covered with a chhatri, a bulbous dome. To climb to the top the staircase is usually in the opposite direction of clockwise. A minaret can be associated with the main structure of the building, it is then called "turret". If it is incorporated in the main building it usually serves as a ventilation shaft. 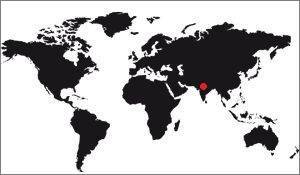 At an exact height of 43,02m, the 4 minarets surrounding the mausoleum of the Taj Mahal are smaller since it is 67.97m. They are arranged on both sides of the mausoleum, framing it. In Taj Mahal the minarets are independent, they have characteristics of being slightly inclined towards the outside of the terrace. 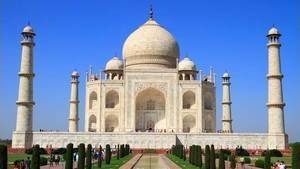 Like that, in the event of an earthquake they would come crashing into the gardens and the Yamuna (The river north of the complex), and not on the mausoleum. It must be known that before Shah Jahan the minarets were not a feature of Mughal art, it is he who introduced them. Subsequently they will be taken over by his successors, in new construction. It is considered more and more evidence of religious orthodoxy in later periods of the Mughal dynasty. Studies have been made on the immobility of the minarets because since they are inclined outwards, we can expect them to lean more and more, a little like the famous campanile, in Pisa. These studies revealed that one of the minarets had actually moved, but that the inclination it took since its construction is weak enough not to have to worry about it. 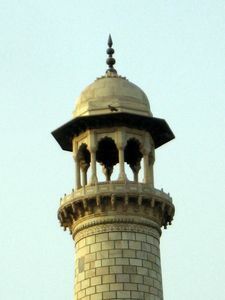 The four minarets of the Taj Mahal have an octagonal base and a slender cylindrical body surmounted by an 8-column chhatri. Each of the minarets is divided vertically into three parts by two balconies that recall the upper gallery. These balconies are accessible by rectangular doors fixed in the main body of the minaret. In order to have light in the minaret, small screened windows were built regularly, which brings in the necessary natural light. The minarets are covered with marble in the form of white marble blocks cut into curves. They were intercalled with black stones to simulate joints. The builders of the Taj were so obsessed with perfection that they even adorned the area below the highest balcony with marble strips of marquetry bearing chevron. The minarets are terminated at the top by chhatris adorned with lotus petals similar to that used for the main dome of the mausoleum. This lotus flower is rather of Hindu inspiration, as explained in the symbols of the Taj Mahal.